Quick and easy this is a great main dish to add variety to your weekly menu. A touch of Thai. Combine the stock, galangal and lemongrass in a saucepan. Gently bring to the boil. Simmer for about 10 to 15 minutes. 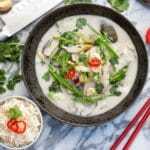 Remove and discard the galangal and lemongrass. Add the coconut milk and increase to a medium heat. Add the pheasant, mushrooms and kaffir lime leaves. Simmer until the pheasant has cooked for about 4 minutes. Then add the mixed vegetables and cook for a further 2-3 minutes and remove from the heat. If the soup is too thick, add more coconut milk or water. Add the fish sauce, brown sugar, lime juice and red chillies. Taste for seasoning and add some sea salt if necessary. There needs to be a balance of sour and salty flavours. 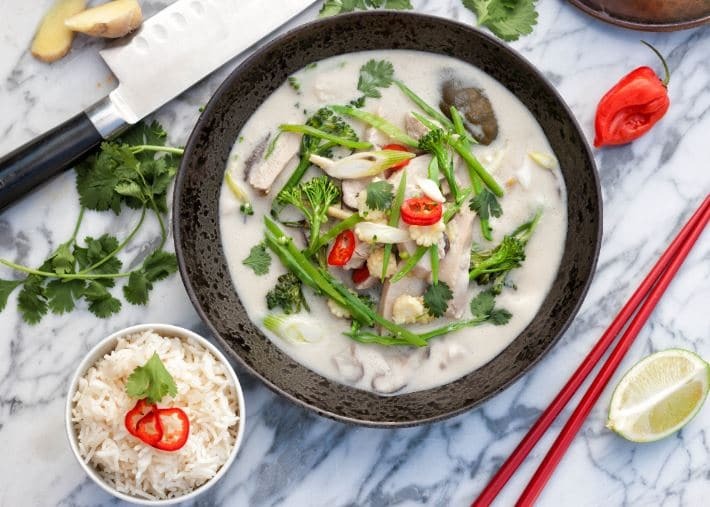 Serve over a generous amount of steamed jasmine rice and sprinkle with chopped coriander.